Romance and enchantment combine with excitement and adventure for an enticing cocktail if you choose to stay in this little house perched up in the trees. Many of us have enduring dreams of sleeping in a treehouse, and are drawn to the intimacy of cozy spaces. Imagine yourself soaking in the fragrant cedar jacuzzi under the starry canopy, relaxing on the two levels of verandas. Sleep in the exotic bamboo bedroom, and awake to rainbows of light bathing you through the multiple stained glass windows. Throw open the French doors and sip local Hawaiian coffee on the lanai while you watch the birds of the forest flirt. This is a playhouse for grownups. Treehouse Accommodation: Visiting a treehouse is an adventure, so staying in one is also an adventure. When booking a stay here, please keep in mind that some agility is required to hike into the treehouse through the forest, and ascend into it. To enter the top level, you will go through a trap door. The access is through the actual forest, and the house is built over top of a lavatube, in the trees. 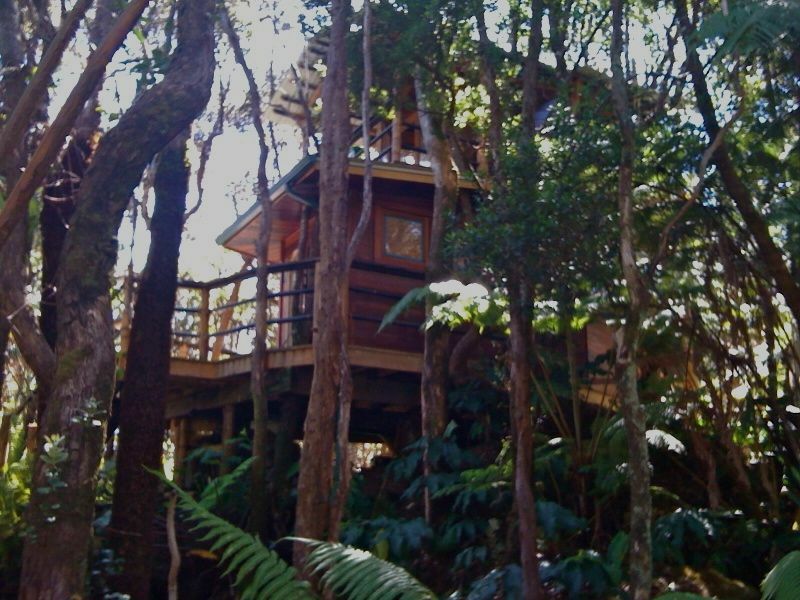 Eco-stay Aspects: Mahinui Na Lani is treehouse designed by Roderick Romero, whose work appears in the book 'Treehouses of the World'. It is built of sustainable bamboo and recycled lumber and windows from Oahu. Power is from the sun and wind, and back up by a generator. Water is the rain that falls from the sky, that is captured onsite and stored in a catchment tank, then filtered. We provide drinking water. You shower and soak in the rainwater. Forests of Kilauea: The location is just outside the gates to Hawaii Volcanoes National Park, in a forest of giant tree ferns and towering trees. This is the same forest that you enter through the main gates of the park. Altitude is about 4000 feet. Temperatures are cool in the evenings, and damp days can also be chilly. Your explorations of the area will take you quickly to warmer and drier areas. Often there is a fine mist, called pineapple rain. One of the more fun ways to get warm (other than in the cedar hot tub) is to drive into the park and stand next to a steam vent. Volcanoes National Park has an array of extraordinary sights and adventures, including flowing lava, petroglyphs, guided tours, hiking across volcanic craters and through lava tubes, a road to the sea, and a visitor center and gallery. Bathroom is divided. There is an outdoor shower, and indoors a composting toilet and vanity. Overall this was a novelty location to stay for us. While there were great aspects to it we won't sugar coat things for you. Neat idea, loved the jungle, and outdoor shower, the cute walk way, the tasty little cookies we were given and of course the nice warm hot tub to go in. Ok movie selection with some newer things (limited). We did however, feel that this once beautiful treehouse is no longer care for as well as I'm sure it once was. It's sad to think it is going down hill. The wood on the deck is rotting, the hot tub was very fuzzy, the inside walls and floors were very dirty, the kitchen had large beetle like bugs that crawled all over the dishes and cookware, the mats when we got there were dirty and wet and gross to walk on. Just disappointing once you sit down and look around. The other thing you need to know is they run on MiWi, we had 1GB of data for the entire stay. When we arrived the device was dead. The treehouse is also on a generator so if you are hoping to stay up late and cuddle, watch a movie, cook food, go in the hot tub you have to worry nonstop about running out of power. We had no idea what it took to run out so we were not on luxury living mode. Ok this is long, I waited weeks before writing this so I could relax and write but honestly my impression of the place didn't change. Unfortunately, I would never stay here again, we were far to upset with the cleanliness and lack of love for the place by the owners. (Whom we never met, we did meet their assistant who showed up at the door at 7pm...on our honeymoon night stay...she was suppose to meet us at 4 at check in). Anyway, to end on a good note: The bedroom luckily was clean with no bugs, and a very cozy mattress! Our attention was just drawn to this review by a guest who is looking forward to a stay and now is deeply concerned. I would be too, seeing this. Meagan requested a late arrival and late checkout and we complied with both requests. Other than that we did not hear from her during her stay. There were no issues brought to us about the power or anything else. Had she asked about the power supply we could have reassured her. It is rare that anyone uses it all up in the evening, but it can happen if there are multiple electronics plugged in and going in the little treehouse. The 1 GB of data is plenty for checking email and social media. It is inadequate for watching on line movies. We are sorry her stay was so dismal. The treehouse is not for everybody. The forest location means it is a different type of stay than a hotel. Higher than usual temperatures during her stay meant more insects. We are in nature. Most of our guests do not come to us through this site, so sadly there are not recent reviews to give you an idea of how other guests have experienced the treehouse. There are plentiful reviews at other locations we are not allowed to cite here. Hopefully anyone reading this can readily find them. We forgot to write in the book provided, but we have to say we were blown away with the Treehouse, the design, the comfort, the eco friendly mindset and of course the Hot tub! Such a Beautiful relaxed authentic place , i highly reccommend this and 100% we will be back ! Thanks for taking the time to write a review. Hope you do come back. Much aloha. Would love to see you again. This place is truly special. This is a super private magical treehouse tucked away in the rainforest. My husband and I booked this treehouse for two nights on our honeymoon. We woke up to the sounds of beautiful birds and the coqui frog. It was so peaceful, and although it rained, it just made the hot tub experience that comes with it that much more enjoyable! The outdoor shower was amazing. This treehouse has so many beautiful details to it, that although the pictures are breathtaking there are just some things photos cannot capture. We hope to stay here again someday in the future! Thank you Gail and Robert for the amazing experience. Aloha! Aloha! We are so happy you stayed with us. Glad and grateful you enjoyed the treehouse. would love to see you again. Mahalo nui. This treehouse was magical. It really is as fabulous as it looks in the photos. We stayed for three nights -- during which time it rained nearly continuously -- and we loved every second of it. The forest is verdant and lush, the treehouse is sweet and cozy (hot tub! Jøtul stove! outdoor shower! ), very near Volcano Village and the Hawai'i Volcanoes National Park. Go up to the Jagger Museum every night after dark to see fire fountains and gas plumes at the caldera. Hosts Gail & Robert are super nice and have really put their hearts into this place. Like a dream...except it's REAL! I stayed in the treehouse 3 nights in the middle of my two week honeymoon to Hawaii (7/10-7/13). Gail was very responsive throughout the entire process and we even had two phone conversations leading up to our stay. Since Gail and Robert were out of town when we arrived, we were met by their assistant Tia. Tia explained all the do's and dont's of the treehouse, which was very easy considering the treehouse is "off the grid." The pictures on the website depict the treehouse perfectly. It is spacious for 2 people when utilizing the indoor and outdoor space. The details and construction of the treehouse is well thought out (anytime you needed more light somewhere there was one, anytime you needed a hook to hang something there was one, etc...) My two biggest concerns about staying in the treehouse was a hot shower and bugs! Tia assured us that the outdoor shower does have hot water (and great pressure too!) and the climate of Volcano Village is a bit chillier than sea level so there were no bugs! I really enjoyed the location of the treehouse because it is completely secluded by trees; however, it is located in a quiet neighborhood so you know you're not in the middle of nowhere (even though it feels like you are!) If you are looking to do something different to celebrate your honeymoon or anniversary, staying at the treehouse is an absolute no brainer. The location is within walking distance to Volcano Village, a short drive to Volcano National Park, and perfect for a day trip to Hilo. There are no words to describe how magical the treehouse is, you just have to see it for yourself! Thank you for sharing your joy. It matters to us as hosts what our guests experience, and it matters to Tia who helps us with preparation and maintenance. We are so happy your visit was everything you wanted it to be. Much aloha. Best stay of the entire trip. My wife and I wanted a place to be off grid and close to the nature for our late honeymoon, and the tree house is the perfect place for it. It's clean, isolated and on a tree, nothing can top that. If you're looking for something exciting, fun and of course EXOTIC place to spend few days of your vacation, this is the place for you. The owner was there to greet us and provide some information regarding the places to eat, activities etc. The place is close to the volcanoes national park, so you can go to the part at night to watch the glow from lava. close to the village for some great food. we liked the place so much we're already planning to stay here on our next trip. definitely recommend to all my friends and family. Ski: Ski a volcano? Is this a joke? You won't be skiing lava, but there is snow on Mauna Kea in the winter, and there are those who helicopter ski there. The $85 cleaning and prep fee is per week. This means it repeats every seven days. Thus, for a stay of 8 nights, the fee is $170. The reason for this is daily service is required at the house. Please note this is a NO Smoking house. Mahalo!